In Costa Rica, October is our May. Birds begin to filter down through this southern part of Central America by August but the biggest avian movement happens during the third and final weeks of October. While birders up north are pishing up sparrows, digging the Autumn weekend at Cape May, or twitching vagrants, we are busy with kingbird flocks during our height of migration. A River of Raptors is flowing in the Caribbean lowlands, the tens of thousands of vultures and hawks flanked by streams of Chimney Swifts and swallows. Put the focus on infinity, look up into the blue, and you will probably see a constant movement of swallows no matter the time of day. 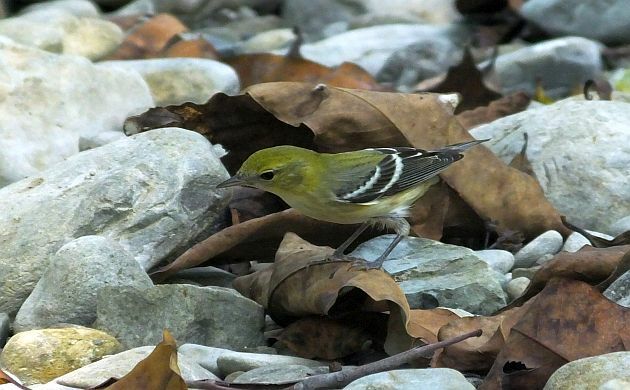 Check the nearest fruiting fig and you would be hard pressed not to find a few Red-eyed Vireos, Summer Tanagers, Baltimore Orioles, Swainson’s Thrushes, and a Scarlet Tanager or two. We might not get the variety of a New Jersey autumn but we do get major numbers of species that winter in South America. Most of them fly on the Caribbean side, especially along the coast south of Limon, and that’s why I guided the Birding Club of Costa Rica down that way this past weekend. Some of the Birding Club at Selva Bananito. On past trips, we have been to Manzanillo and the Cahuita area and the birding has always been exciting. 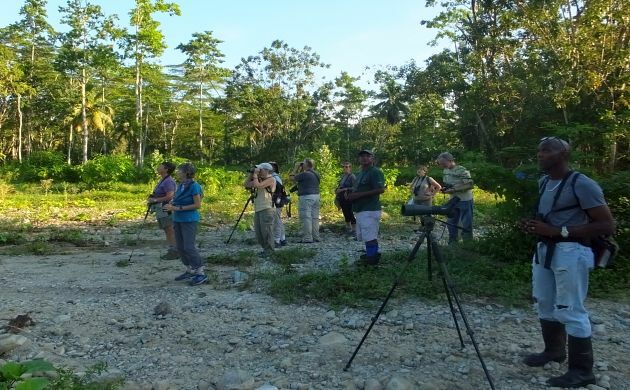 However, this year, we opted for a site that could also give a chance at Great Jacamar and a few other key resident species in addition to migrants. That site is Selva Bananito and as it turns out, perhaps not by coincidence, it’s also a place where conservation coincides with migration. Selva Bananito was actually founded in the seventies but back then, it was a sizeable farm like any other. Fair parts of the property were used to cultivate different crops, some areas were pasture for cows and horses, and other areas were covered in forest that was meant to be logged, selectively or otherwise. However, some time between then and now, the children of the original farm owner convinced their father to leave the stands of primary forest alone, to let precious mahogany trees just be and keep on growing. They reforested certain parts of the farm, built an ecolodge, and have been committed to sustainability ever since, including being involved with the offsetting of carbon emissions caused by travel to and from the hotel, as well as supporting a local rural school. There are a lot of pewees that pass through Costa Rica: Based on past experiences of pewee mania, I already knew this to be the case but this trip really took the cake. From the time we started driving through the lowlands, we could not escape views and calls of Eastern Wood-Pewees. By far the most common bird encountered, the small drab flycatchers quickly became the avian hubris in our fields of view. I hate to say that but when you have to wade through pewees to find an Empid. or almost anything else, that’s the way the birding ball bounces. However, it’s also true that when pewees are calling and flying from nearly every stick, it’s going to be a damn good day of birding. Along with lots of other migrants: Once you learn to ignore the peewees, you can pick out the many other migrants likewise taking advantage of the tropical abundance. Many of these were using the reforested areas of Selva Bananito and included banner numbers of Bay-breasted Warblers (more than I have ever seen in Costa Rica), dozens of Red-eyed Vireos along with a few Yellow-green Vireos, the occasional Olive-sided Flycatcher, Scarlet Tanagers, and many, many Great-crested Flycatchers. The next time you see a Bay-breasted Warbler in May, know that it might be singing its heart out because it was able to use habitat at Selva Bananito and other protected areas in Costa Rica. I think we saw more than 30 Bay-breasteds in one day, in one fairly small area. Some were feeding on the ground. The River of Raptors was intense: I am pretty sure that this past Saturday was one of the bigger raptor migration days encountered in Costa Rica. The constant flow of Turkey Vultures and Broad-winged Hawks was par for the course but when we scoped a few kettles of Swainson’s Hawks that numbered in the thousands, we suspected that the day was a big one. My suspicions were confirmed when I heard reports from other observers who remarked on the incredible migration that occurred in Costa Rica on October 21st. Black Swift! : Nope, I wasn’t fast enough for a picture. I wish I would have been quicker on the camera draw because the bird was low enough to see that it very well. It was migrating with a constant stream of Chimney Swifts, I wonder where it spent the summer? Parrots galore: Down by this one river, there were flocks of Mealy, Red-lored, White-crowned, Blue-headed, and Brown-hooded Parrots. Parrots in Costa Rica require plenty of old trees for nesting as well as for food. Seeing and hearing so many is a good sign that the habitats at Bananito are functioning well. We also had three parakeet species, and, best of all, a fast-flying flock of the little known Red-fronted Parrotlet! Snow in the form of a cotinga: For those who aren’t aware, cotingas are sort of the cream of the crop of the neotropical avifauna. Like royalty, they sport brilliant glowing blues, reds, and other colors, look and sound funny, and tend to be uncommon. There are three snow white species, two of which reside in Costa Rica. 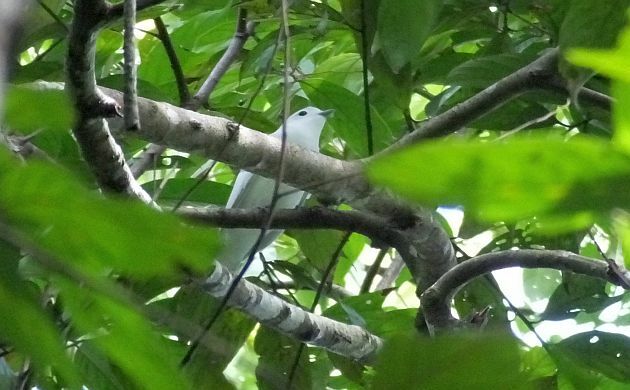 One of those, the Snowy Cotinga, is fairly common at Selva Bananito. We saw them do their butterfly flight over the tree tops every day. Their regular appearance didn’t stop them from being camera shy. The greatest one: And yes, we did see a Great Jacamar! Truly a last minute bird, most of the group were already in the cars and ready to leave when local guide Justo and myself heard one give its raptor-like vocalization (it also gives a cat-like one). The bird came to the edge of the forest and even waited long enough for everyone in the group to see it through the scope! 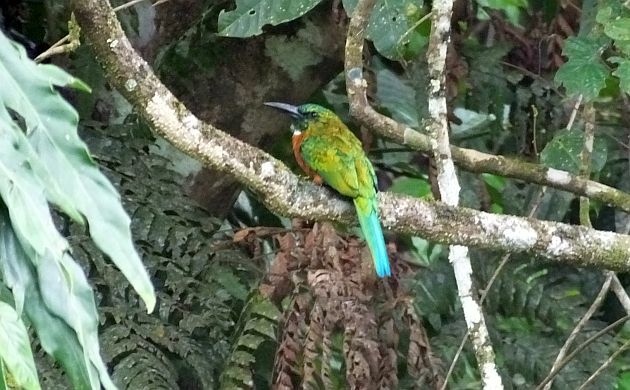 Lifer for most, a mega year bird for me, and an opportunity to admire iridescence somewhere between a motmot and a quetzal. The picture might not be so great but the bird is. Owls: From my cabin, during less than an hour, I heard Crested, Spectacled, Mottled, and Central American Pygmy owls as well as Great Potoo and Collared Forest-Falcon. Scope looks were had at the pygmy-owl just before we saw the jacamar. Birding potential: All of the above point to Bananito harboring a great degree of birding potential. The property is so large, there are several areas that see little coverage including extensive primary forest that goes into the foothills. Part of the road to the lodge also goes through very promising habitat, and in being situated on a flat jeep track, is ideal for birding with a group. Camera traps deep in the forest have recorded Jaguar, Puma, Ocelots, and other animals. I wonder what else is back there? The high number of migrants and quality species not only show how important the area around Selva Bananito is for birds, it also shows that reforestation and sustainability in practice do indeed work to provide food and shelter for a wide variety of species. If you visit, tell Justo, Jurgen, and Harvey I said, “Hi”, and please share your eBird lists in the comments. My eBird list from Saturday. Where Are You Birding This Final Weekend of October 2017? Where Are You Birding This Second Weekend of May 2014?